The imported project “C:\Program Files (x86)\MSBuild\Microsoft\CRM\Microsoft.CrmDeveloperTools.CrmClient.targets” was not found. Confirm that the path in the declaration is correct, and that the file exists on disk. Error connecting to CRM Server. [A]Microsoft.CrmDeveloperTools.CrmClient.Entities.Solution cannot be cast to [B]Microsoft.CrmDeveloperTools.CrmClient.Entities.Solution. Type A originates from ‘Microsoft.CrmDeveloperTools.CrmClient, Version=1.0.0.0, Culture=neutral, PublicKeyToken=31bf3856ad364e35’ in the context ‘LoadFrom’ at location ‘C:\Program Files (x86)\Microsoft Visual Studio 10.0\Common7\IDE\Extensions\Microsoft\Dynamics CRM 2011 Developer Tools\1.0\Microsoft.CrmDeveloperTools.CrmClient.dll’. Type B originates from ‘Microsoft.CrmDeveloperTools, Version=1.1.0.0, Culture=neutral, PublicKeyToken=31bf3856ad364e35’ in the context ‘LoadFrom’ at location ‘C:\Program Files (x86)\MSBuild\Microsoft\CRM\Microsoft.CrmDeveloperTools.dll’. Error connecting to CRM Server. [A]Microsoft.CrmDeveloperTools.CrmClient.Entities.Solution cannot be cast to [B]Microsoft.CrmDeveloperTools.CrmClient.Entities.Solution. Type A originates from ‘Microsoft.CrmDeveloperTools, Version=1.1.0.0, Culture=neutral, PublicKeyToken=31bf3856ad364e35’ in the context ‘LoadFrom’ at location ‘C:\Program Files (x86)\Microsoft Visual Studio 11.0\Common7\IDE\Extensions\Microsoft\Dynamics CRM 2011 Developer Tools\1.0\Microsoft.CrmDeveloperTools.dll’. Type B originates from ‘Microsoft.CrmDeveloperTools.CrmClient, Version=1.0.0.0, Culture=neutral, PublicKeyToken=31bf3856ad364e35’ in the context ‘LoadFrom’ at location ‘C:\Program Files (x86)\MSBuild\Microsoft\CRM\Microsoft.CrmDeveloperTools.CrmClient.dll’. depending on the combination of Visual Studio version, installed Developer Toolkit version and previously installed Developer Toolkit versions. 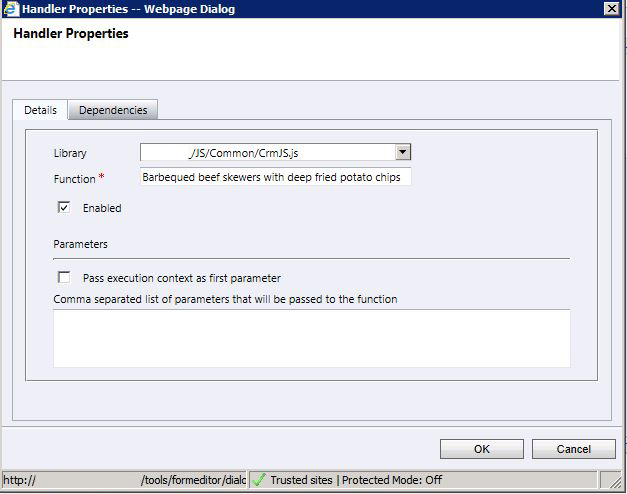 In Visual Studio, right click the CrmPackage project and click Unload Project. Right click on the CrmPackage project and click edit CrmPackage.csproj. Find the line starting with “<Import Project="$(MSBuildExtensionsPath32)\Microsoft\CRM\" and replace it with the correct path from the list below. Right click on the CrmPackage project and click Reload Project. Current key (KeyType : CrmWRPCTokenKey) is expired. This can indicate that a key is not being regenerated correctly. Current key (KeyType : CrmWRPCTokenKey) is expired. This can indicate that a key is not being regenerated correctly. Current Key : CrmKey(Id:XXXXXXXX-XXXX-XXXX-XXXX-XXXXXXXXXXXX, ScaleGroupId:00000000-0000-0000-0000-000000000000, KeyType:CrmWRPCTokenKey, Expired:True, ValidOn:01/01/2012 06:49:05, ExpiresOn:01/01/2012 06:49:05, CreatedOn:01/01/2012 06:49:05, CreatedBy:Domain\User. The formatter threw an exception while trying to deserialize the message: There was an error while trying to deserialize parameter http://schemas.microsoft.com/xrm/2011/Contracts/Services:request. The InnerException message was ‘Error in line 1 position 674. Element ‘http://schemas.datacontract.org/2004/07/System.Collections.Generic:value&#8217; contains data from a type that maps to the name ‘http://www.w3.org/2001/XMLSchema:Money&#8217;. The deserializer has no knowledge of any type that maps to this name. Consider changing the implementation of the ResolveName method on your DataContractResolver to return a non-null value for name ‘Money’ and namespace ‘http://www.w3.org/2001/XMLSchema&#8217;.’. Please see InnerException for more details. The following is the correct way to format a Money field in a SOAP create or update request in CRM2011. The request channel timed out while waiting for a reply after 00:01:59.9844005. Increase the timeout value passed to the call to Request or increase the SendTimeout value on the Binding. The time allotted to this operation. The error message above is caused by the maximum amount of time a single channel operation has to complete before a timeout fault is raised on a service channel binding being reached. The fix for this, when not using Microsoft.Xrm.Client.dll’s CrmConnection class to connect to CRM, is well documented in several posts, (such as Dynamics CRM in the Field). When using the Microsoft.Xrm.Client.dll’s CrmConnection class to connect to CRM, we can achieve the same thing by setting the Timeout property on the CrmConnection.